Determine focal length of a lens. Introducing the new Cenco AP Physics lab series. Ideal for AP, B and C, IB, and advanced honors physics courses, each of the 24 experiments is aligned with the College Board AP Curriculum. The teacher guides and student manuals are authored by an experienced AP Physics teacher, so you can trust the setups to be successful in your classroom. Lead students through these hands-on labs using the outlined guided-inquiry approach. All labs come complete with instructions and materials for up to six students per lab group, the inquiry based instructions are found in the separate manuals. For your convenience, labs are packaged to allow you to purchase only what is required for each experiment. Examine the path a light ray takes when it passes through various transparent media and then use this understanding to determine the focal length of a lens. 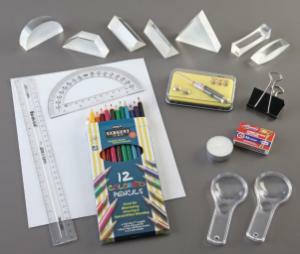 Students will calculate the index of refraction for objects, as well as the critical angle. The kit includes a line laser, lens and prism set, colored pencils, protractor, ruler, magnifying glass, projection screen, candle, and matches. Required but not included are support stands and a meter stick. *AP and the Advanced Placement Program are registered trademarks of the College Entrance Examination Board, which was not involved in the production of and does not endorse these products.